Science Museum of Virginia's "Lunch Break Science"
Our client, the [Science Museum of Virginia](http://www.smv.org), has a free weekly ["Lunch Break Science"](http://www.smv.org/upcoming-events) presentation series that covers a spectrum of topics that affect or daily lifes in relation to science while you eat your bagged lunch. V4 Development was able to attend Anne Wright's presentation titled, "Biodiversity in James River Park System." Anne Wright is the Director of [VCU's Life Sciences Outreach program](https://lifesciences.vcu.edu/community-engagement/) and she showcased candid videos taken of wildlife by the James River. To learn more about Anne's project, visit [JamesRiverPark.com](http://www.JamesRiverPark.com) --- **About Science in the Park:** --- Science in the Park provides science-focused educational materials about the geology, habitats, and flora and fauna of the James River Park System in Richmond, VA.
We hope to enrich the Park experience for local and regional school systems, communities, visitors and regular users of the park through web-based, self-directed explorations, guides, videos, and lesson plans. Only when people know something can they love it; only when people love something will they cherish and protect it. Science in the Park is a collaborative effort between Virginia Commonwealth University’s Rice Rivers Center, Department of Biology, Ralph White, the Friends of the James River Park, the City of Richmond’s James River Park System, and many, many other talented and knowledgeable individuals. --- **Below is the upcoming list of "Lunch Break Science" presentations at the [Science Museum of Virginia](http://smv.org):** --- Kristopher Bedka presents **GOES-R/S Geostationary Satellite Data to Improve Weather Forecasting** on April 11! Leanne Yanni presents **What You Need To Know about Palliative Care** on April 18! Carrie Rose Pace presents **GRTC Pulse: New Rapid Transit Service Arriving 2018! ** on April 25! Callan Bentley presents **A Billion Years of Superlative Geological Activity in Virginia** on May 9! 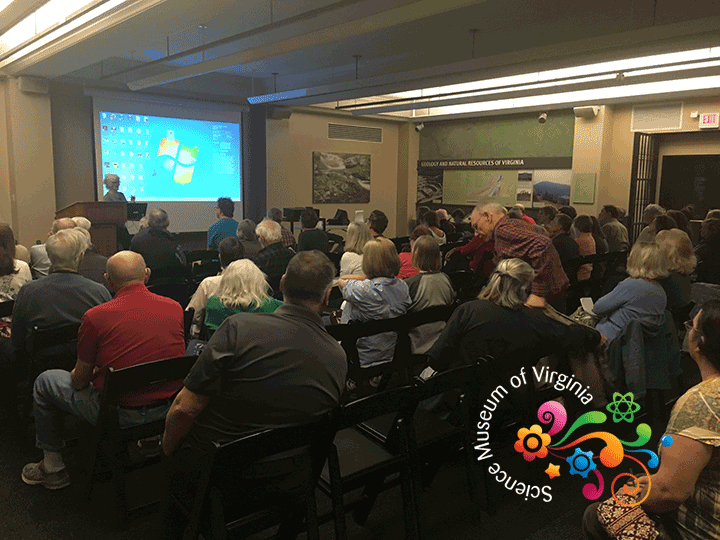 David Spears presents **Understanding Virginia's Geology in 2018** on May 16! Dr. Reed Johnson presents **The Life and Hard Times of Neutrons: Nuclear Reactors 101** on May 23! Officers Nathan Raecke and Shaun Campbell present **Explosive Detection Police K9s** on June 20! Everett L. Worthington, Jr. presents **Heroic Humility: What the Science of Humility Can Say to People Raised on Self-Focus** on August 15! Bruce MacAlister presents **Using Radio Waves to Study the 2017 Solar Eclipse** on August 29! Jaime Brunkow and Nat Draper present **State of the James: Restoring Watershed Health and Educating the Next Generation of River Stewards** on September 5! Dr. Eric R. Carlsen presents B**ack to the Future: The Chiropractic Profession** on September 12! James Blow presents **Bringing Out the Dead Returns: More Gruesome But True Tales of Grave Robbing for Medical Science** on October 31! Ben Watson presents **Climate Change in the James River Basin: Local Effects from a Global Issue** on November 7!